This is my Artist Statement for the Frieze Frames show. 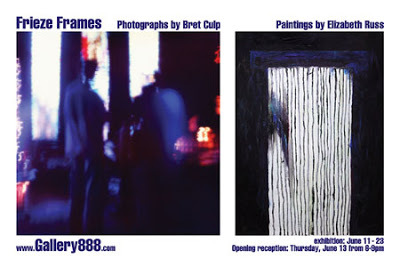 The show consisted of abstract paintings by Gallery 888 owner Elizabeth Russ and my photographs that were impressionistic in content, technique, or both. It is my experience that many people maintain a very narrow view of what constitutes a proper photograph. For these individuals a photograph must be in perfect focus and properly oriented, be relatively grain or noise free, have realistic tones or colours – be a faithful representation of what was in front of them when they captured the image. On the other hand, what is accepted in painting, for example, ranges from photorealism to abstract expressionism. I believe that the authenticity of the final image should not be based on how loyal it is to reality but how well it conveys the artist’s message. Painters, musicians, writers, or photographers all have the same goal, which is to express something. The photographs in this show range from the architecturally inspired Futurism (Cheeses Worst Nightmare), a black and white pinhole camera study of a cheese grater, to Atomic Hotel, an impressionistic Polaroid sx-70 photograph with bleeding light and colour, to Reflections on the Wall, a colour photograph of a flower growing out of a graffitied section of the Berlin wall. When rotated 90 degrees the graffiti appears as reflections on a river. The impressionistic qualities were further enhanced in the choice of materials – prints are made on textured cold-pressed watercolour paper.